Contrary to popular myth, modern root canal treatment is not a painful experience. Our root canal specialist, Dr. Joseph Ghosh, apply the most refined techniques and use new high-tech equipment (digital apex locator, digital radiography, high-torque handpieces, nickel-titanium files, powerful local anesthetics) to deliver painfree, effective & quick therapy. What are the advantages of modren root canal treatment over the conventional way? Painfree: 99% of the cases are absolutely pain free. Higher success rate: more than 95% of success compared to 50% with the conventional technique. The procedure involves tooth disinfection and the removal of all debris (nerve tissue, lymph tissue, blood tissue, bacteria and infection) from the pulp chamber and its associated canals. Once the canals are totally cleansed and shaped, they are filled with materials designed to prevent pain and infection from recurring. What exactly is a Root Canal Re-Treatment? 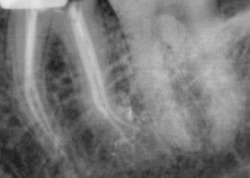 Old techniques of root canal treatment were not able to totally clean the canals and the risk of infection and abcess formation is always present. That's why we recommand "root canal Re-treatment" to treat or to prevent infections resulting from a previous deficient treatment. Why do i need a root canal Treatment or Re-Treatment?